Break through business routines to find creative solutions! Since January 2019, the Technopark Zurich provides a temporary Challenge Room, which start-ups as well as representatives from SMEs, larger enterprises and firms from Technopark Zurich can reserve for up to several days to work on their projects or conduct workshops. If required, start-up and industry experts will provide new impulses and initiate creative thinking processes. The processing of own topics and projects is in the focus, but also specific offers for start-ups (free of charge!) and enterprises can be booked. Challenge your pitching skills! How do I best present to investors? Or: Define your own entrepreneurial challenge! 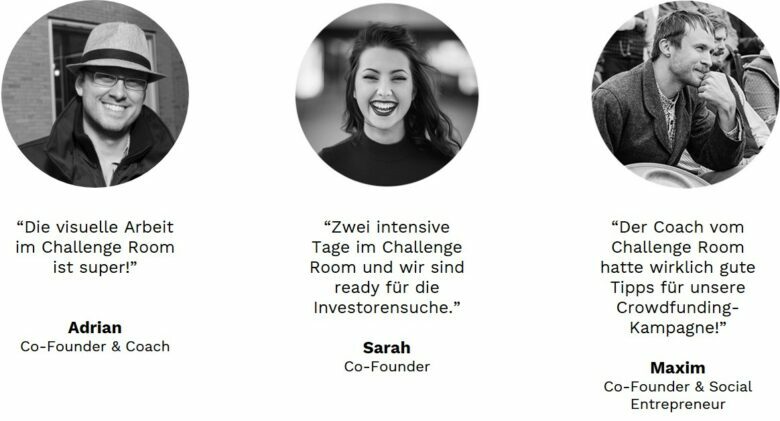 Solve your challenge in the Challenge Room and get free of charge advice from start-up experts! Or: Define your own business challenge! E.g. suitable for: Brainstorming, Team Building Exercises, Strategy Meetings, Product Design, Co-Creation etc. / Not suitable for: Presentations to potential clients or investors (but to prepare them), regular team meetings or updates, employee information, etc. How to book the Challenge Room? Room requests are accepted at any time. Please fill out the inquiry form or contact us personally. Break through your business routine and start working in the Challenge Room – here you will find solutions in a focused and creative way!